Looking to grab a cup of coffee or a quick bite to eat? Try one of these establishments in and around Albany, NY! Each of these diners, cafes, and coffee shops have an extensive array of hot and cold beverages, baked goods, and other delicious menu items for you to fall in love with. 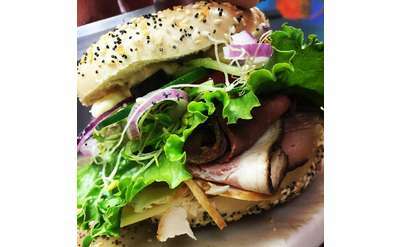 Authentic NYC bagels, hand rolled and boiled, as well as made-to-order breakfast and lunch sandwiches, breakfast and lunch wraps, organic coffees and espresso drinks, fresh organic salads, and the most comfy hippie lounge around! Sunday Brunch! Enjoy a hot or cold beverage or a baked treat at your neighborhood Starbucks! Bob's Diner is open 24 hours a day and serves breakfast, lunch, and dinner to enjoy in the diner or at home. The Happy Cappucino has a wide variety of certified organic and fair trade coffees that can please any palate! The warm, friendly atmosphere is a perfect place to start your morning or end a hectic day. Run by the same family for nearly 100 years, Perreca's offers a delicious array of breads, baked goods, and Italian favorites. If you're looking for a great meal at an even better price, try Dan's Place Two on Washington Avenue in Albany. Dan's offers ample portions of breakfast and lunch favorites in a quaint, diner atmosphere. Joey G's four Capital Region cafes offer diner-style favorites, like soups, salads, cold and hot sandwiches, and breakfast options. Sandye's has a delicious menu of homemade baked goods, plus items for breakfast and lunch. Have a special event coming up? Sandye's also offers catering services! Located in the heart of Albany, Uncommon Grounds serves up delicious coffee, sandwiches and more.